Time for more fun with mini loaf pans! If you’re out and about this weekend, consider picking up a couple because they are quite handy, especially if you’re cooking for two or want to make small loaves to share with multiple neighbors. Plus you can make these little cakes! I was trying to make mini pound cakes, but the cakes turned out more like regular dense, moist, chocolate cake, so for those of you wondering what the texture is like, there you go. What’s left of the cake tastes slightly better on Day 2 after being sealed in a lidded container on the counter, but the cake was good on Day 1 too, so you don’t have to make it ahead. And right now I’m crazy for ganache. It takes 2 minutes to make, you can use small amounts of very good chocolate, plus it adds extra moisture to the cake. The reason the side of the cake looks kind of swirled is that the cake is brown and made with natural cocoa, but I dusted the pan with extra dark cocoa so there’s a contrast. Also, for now I recommend using natural style cocoa because the cake rises so nicely and acid plays a role in the leavening action. However, it might not be a big deal if one were to use Dutch. I haven’t tested it yet. What I did love was the little bump in the middle. I baked one cake in a metal loaf pan and the other in a ceramic loaf pan and am wondering if the type of pan had anything to do with the formation of the big, cute, bump. In other cakes it wouldn’t be so cute, but in this cake it was. Preheat the oven to 325F. 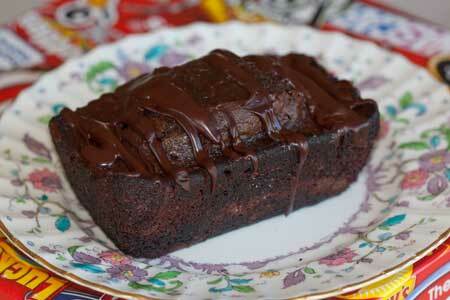 Rub two 3x5 inch mini loaf pans with shortening or butter and dust with cocoa powder. Combine the flour, sugar, cocoa, baking soda and salt in small yet deep mixing bowl and stir very well. Add the soft butter and squish it around with the back of a spoon, coating the flour mixture. Stir in the buttermilk. With a hand-held mixer, beat the mixture for about two minutes, scraping sides of bowl, until smooth. Mix the lightly beaten egg, vanilla and cooled coffee together in a small bowl or measuring cup. Add to the batter in three parts, stirring gently with a spoon until mixed. Stir in the chocolate chips. Bake on center rack at 325 F for about 45 minutes or until a toothpick inserted in the center comes out clean. Cool in the pan set on a wire rack for about 10 minutes, then carefully turn from pan. To make the ganache, heat the cream for about 30 seconds (or just until hot) in a microwave-safe measuring cup. Add the chocolate. Let sit for a minute, then stir until melted and smooth. This ratio thickens pretty quickly and is harder to drizzle So to drizzle, transfer to a zipper bag (heavy duty is best, but regular is okay if you're careful not to break it) snip a tiny bit off the bottom corner of the bag, then squeeze lines of ganache over the loaves. Chill to set the ganache. Anna, the mini cake was SO good! Jamie’s cake pan was perfect for a half version. I didn’t have heavy cream so instead we sprinkled some extra chocolate chips on the surface of the cake. It was really delicious and the perfect size for the three of us. 🙂 It finished in about 35 minutes in the Cuisinart. Melissa, good luck! I’m sure cutting it in half would be fine if you’re careful with the measurements. The Cuisinart toaster is much better than an Easy Bake. When my sister-in-law’s oven broke right before our Christmas dinner, we used it to bake the challah and it worked really well! Yes, we had challah and lit Chanukah candles on Christmas this past year… lol. Jamie got a bake set for Chanukah that we haven’t used yet, and I think I’ll make one of these cakes with him tomorrow — it’s OK if I cut it in half, I assume. Hi Shannon, I haven’t tested a double batch, but I’m almost positive it would work. You bake-time might be slightly different if your pans aren’t 3×5 (some of the linked pans are smaller), but I think a double batch would be fine. To double the egg, just use 1 whole egg instead of 2 tablespoons. I would like to double this recipe. My loaf pans are “linked” together and I have four so might as well use all four. Do you know if the recipe will double without issue? I wish I was your neighbor! I’d love one of these cute little cakes. They look lovely! I keep meaning to buy mini loaf tins but I still haven’t gotten round to it. Will be trying these when I finally do though! These look great! I made some mini lemon pound cakes as x-mas gifts for my husband’s co-workers and they were a hit. People really enjoy receiving their own individual mini cake. Yummy! I love ganache, too. Such a perfectly simple chocolate “frosting”. So which pan did you get the cute bump in–metal? or ceramic? This look delicious! Love the swirl, can’t wait to try it. Can’t wait to try these…LOVE chocolate. This way I won’t eat too many of them!! This looks fun and I love the mini size! I’m crazy for ganache too. The last time my mother in law made a pound cake, my husband and I doctored it up with fresh strawberries, whipped cream and chocolate ganache. It was incredible!